Note: The RoadPro RP-51LL Has Been Discontinued & Replaced by the JJ Keller 612MP, which has only 2 lines for Shipments on Truck and Unloaded. 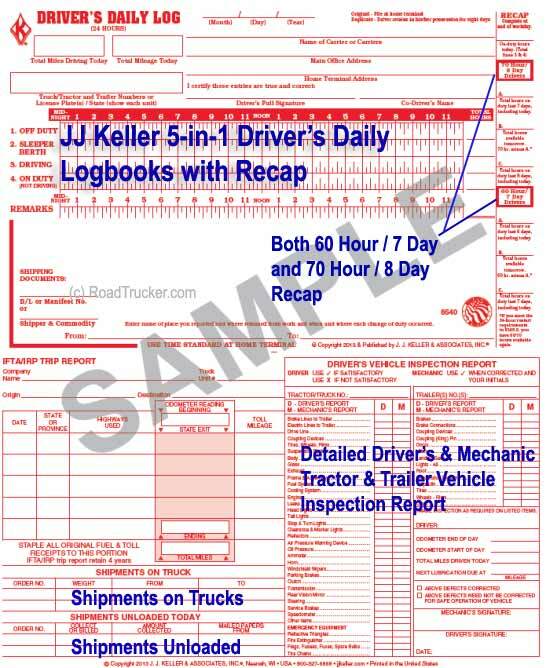 JJ Keller’s 5-In-1 Duplicate Driver's Daily Logbooks are booklet form logs for Truckers. Everything is on 1 page, making it easy to keep track of logbook, vehicle inspection report, shipments on the truck, deliveries made and mileage driven by each state. Except for a private motor carrier of passengers (non business), every motor carrier shall require every driver used by the motor carrier to record his/her duty status for each 24 hour period Source: DOT FMCSA § 395.8 Driver's record of duty status. Every carrier shall systematically inspect, repair, and maintain all commercial motor vehicles under its control. 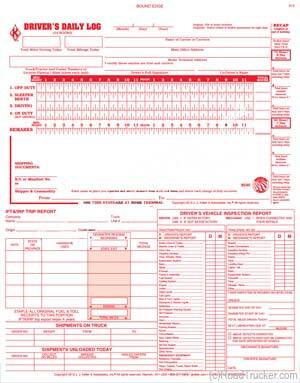 Every carrier must require its drivers to prepare a daily written post-trip inspection report at the end of each driving day. Every driver is responsible for preparing such a report for each vehicle driven. Source: DOT FMCSA Inspection, Repair, and Maintenance (Part 396). 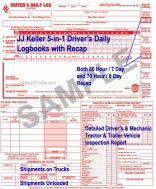 Click on Pictures below to see Detail Pictures of JJ Keller's 5-In-1 Duplicate Driver's Daily Logbooks. Please Note: I've used Pictures of the Regular Duplicate Driver's Daily Logbooks for the Upper Section because the Layout is Identical. For the Lower Part, see the "5-In-1 DDL (Driver's Log)" Below.